The Future of China and Russia: Can a David Fracture a Goliath? Proponents of democracy have reason to hope that history is on their side. The fledgling science of complexity, developed at the Santa Fe Institute and elsewhere, argues that societal fitness cannot develop under a heavy hand or the opposite extreme, anarchy. Top-down rule cannot generate a fit society primed to cope with the complex challenges of modern life. Instead, societal fitness emerges from self-organization close to the edge of chaos. Self-organized crowds in Hong Kong have demanded more self-organization; similar groups in Russia have turned against Putin and urged him to vacate Ukraine. Repression can work for a time but tends to devour its makers. Complexity science helps us understand which of two paths will unfold for China and Russia. Retracing their Stalinist heritage, the first course tightens dictatorship at home, crushes independence in borderlands, and expands abroad. The second path leads to the breakdown of centralized controls at home and a retreat from imperial expansion. The material assets wielded by authorities in Beijing and Moscow favor the first scenario. But little Davids can sometimes topple Goliaths. Thus, the Baltic republics catalyzed the Soviet Union’s collapse. In a similar vein, Hong Kong and Ukraine now challenge the imperial dictatorships of China and Russia. Each country’s president – Xi Jinping and Vladimir Putin – has neutered the green shoots of political and economic freedom. Each president has purged political rivals; appointed viceroys to govern the provinces; and obstructed access to the Internet and other tools by which citizens can bypass censors to gain and share information. Each president tries to suppress political dissenters and ethnic minorities seeking greater freedom. Examples abound. Chinese authorities imprison for life a Uighur professor who calls for equal rights and cultural autonomy for his people. Putin jails potential rivals and robs privately held corporations to enrich cronies and empower the state. The Kremlin plays the nationalist card within Russia and among “compatriots” in former Soviet republics such as Ukraine and Latvia. Despite its material weaknesses, the second path broadens and grows stronger. Why? Top-down dictation deadens the spirit. Centralized controls are inefficient. The absence of free thought and expression permits Chinese and Russian leaders to spawn gigantic projects that damage the environment and harm basic human needs. Chinese authorities ignore the havoc caused by the Three Gorges Dam and now construct huge conduits to carry Yangtze waters to parched lands of the north. As in Stalin’s time, Putin’s Kremlin acts as though bigger is better. It backs projects to extract oil and other resources while doing little for light industries that could better the quality of life. Oppression spawns rebellion. Russia still holds Kaliningrad, the former East Prussia, and bolsters its military there to menace Estonia, Latvia, and Lithuania. But there are 100,000 Muslims in Kaliningrad who have struggled for twenty-one years to build a mosque. Blocked by authorities from acquiring land for a mosque, they plan to appeal to the European Court of Human Rights. Some Muslims in Kaliningrad threaten to enact a Ukrainian-style “Maidan” revolt. Other Muslims in Crimea and in Tatarstan bristle at what they see as persecution by Russians. Across many former Soviet republics, the Russian Orthodox church labors to keep both Islam and Western Christianity at bay. China’s rulers want to avoid the fates of other Communist systems. They believe that Soviet and Yugoslav leaders were foolish to try and meet demands by ethnic minorities. Likewise, Putin spits on appeasement. He plans to draft young Chechens and residents of Crimea into Russia’s armed forces, short of healthy recruits due to declining public health. Not only has the periphery of empire changed, but so has the world beyond. Few outside powers recognize Russian rule of Crimea. Defying Russia, Kiev can join a vibrant trans-Atlantic network that did not exist when Ukrainians strove for freedom in 1918 or 1945. Hong Kong has less outside support than Ukraine, but its example surely roils Xinjiang and other Chinese borderlands and inspires democrats in China proper. Xi has urged Taiwan to “reunite” with mainland China under a Hong Kong-style “one country, two systems” framework – even as his minions gassed and threatened Hong Kong citizens seeking their own system. Russians could gain by following the Baltic republics’ example. Instead, the Kremlin drags its subjects back toward Stalin and Peter the Great. Both Xi and Putin could mimic Singapore. Its one-party rule has fostered both business success and political stability. Its authoritarian ways, however, have inhibited technological and artistic innovation. China and Russia would do better to adapt the model of Taiwan, where – starting in the 1980s – authoritarian rule gave way to democracy. Taiwan’s entrepreneurs and engineers excel even as rival political parties compete vigorously at the polls. Taiwanese have experienced freedom and struggle to sustain it. Totalitarians expect the masses, lacking material power, to tire and acquiesce in top-down rule. Democrats trust that history is on their side. Walter Clemens is Professor Emeritus of Political Science, Boston University, and Associate, Davis Center for Russian and Eurasian Studies, Harvard University. He wrote The Baltic Transformed (2001) and Complexity Science and World Affairs (2013). President Xi told Putin he is looking forward to his visit during a phone call discussing Ukraine. 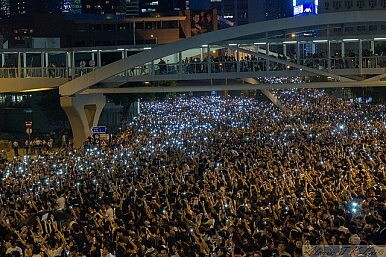 Trump, Putin, Xi, and the Return of KingshipHow to Save Occupy Central5 Lessons from the Hong Kong ProtestsWhat Should the US Do About Closer Sino-Russian Ties?Will Narva Be Russia’s Next Crimea?